Did you start the year by determining to keep a diary of the year’s events? Did you keep it going for long? In the year 1660 a young civil servant named Samuel Pepys not only started a diary but he kept making entries for nine years and created a remarkable document by so doing. Samuel Pepys, a 26-year-old graduate of Magdalene College Cambridge, was at the start of his career as a government servant – he eventually became Chief Secretary to the Admiralty and a Member of Parliament. Although he lived until 1703, the diary only covers nine years, but the period in question included such events as the Restoration of King Charles II in 1660, the plague of 1665, the Great Fire of London in 1666 and the naval war against the Dutch in 1665-7, in which Pepys played an important role. However, the diary is as much a personal document as a record of great events. 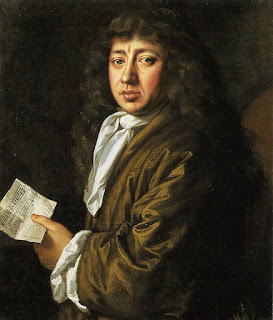 Pepys wrote it for no eyes other than his own – he used a private form of shorthand that needed to be deciphered when the diary was eventually discovered – and he included many intimate details of his private life that were certainly not intended to be read by anyone else. Indeed, it will surprise many to learn that the full text of Pepys’s diary was not published until 1970, more than 300 years after the author made his first entry. The diary was originally discovered among Pepys’s papers when he died, but was not published until 1825 in a version that was severely censored to leave out many of the “naughty bits” in which Pepys detailed his extramarital sexual conquests and other entries that were thought to be indecent. As it is, the diary contains many personal details of ordinary life, such as on the first day when he tells of how his wife Elizabeth had burned her hand when she cooked the Christmas turkey that he was now finishing off, plus a riveting day-by-day eyewitness account of the progress of the Great Fire of London in September 1666. Even here, among the details of houses destroyed and streets threatened, there is the personal touch as Pepys tells of burying a precious parmesan cheese in his garden just in case he should be forced to evacuate his house – which didn’t happen. Pepys’s diary turned out to be one of the most remarkable works in the whole of English literature, as well as being a primary source for some of the most dramatic events in the history of Britain and London in particular. It is also an entertaining document that has inspired many people in subsequent years to mark 1st January in a similar way by starting “Day 1” – some succeed in carrying on but most do not!